Responsive Theme 1 gives the impression of a full width website, and adapts to desktop, tablet and mobile devices. It includes our 9 standard navigation pages along with our new property powering, which includes features such as image galleries, social network sharing capability, keyword radius search and location map, multiple property thumbnails, quick glance icons, local area information on schools, shops, hospitals etc, and negotiator information, plus much more. The large banner image and design is in keeping with current web design trends, and incorporates a slideshow feature as standard, although a static image is also optional. 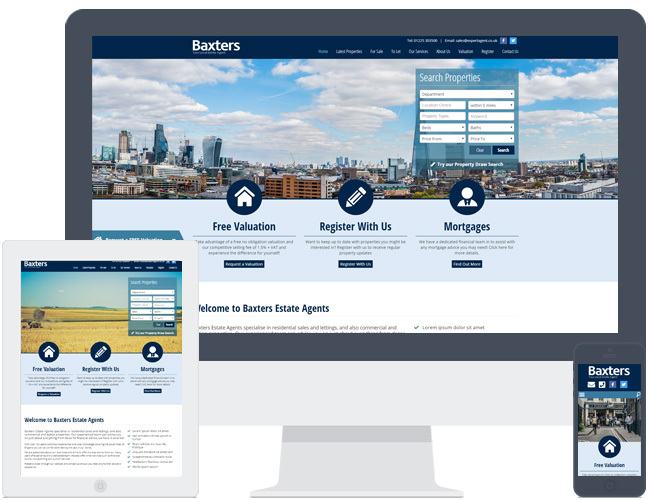 Three large ‘call to actions’ on the home page guide the user to important information – valuations, register and additional services, and these can be changed to suit. A testimonial slider allows you to showcase your customers positive comments. Latest Properties pull in automatically from Expert Agent, meaning one less thing for you to maintain. You can also define a ‘Featured Property’ which will display at the top of the listings page. A nice feature if you want to highlight a particular property. The website comes with a valuation and register form as standard. The registration form will automatically populate as a new applicant in Expert Agent, and notify you when someone new has registered.